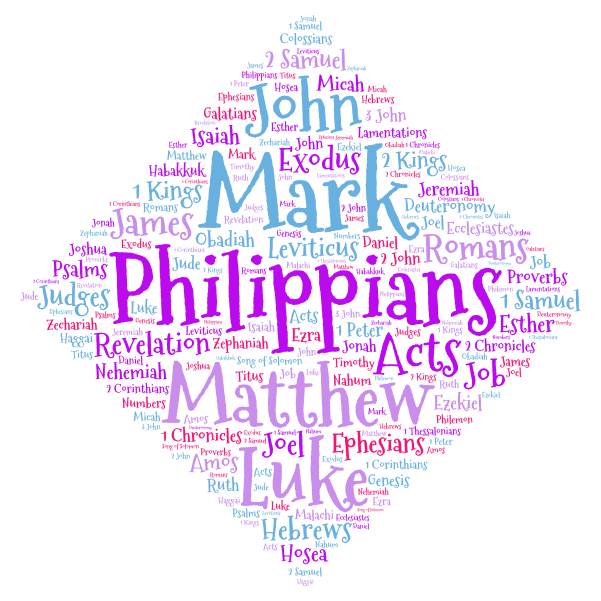 The Books I Love… New Testament version! It’s hard to think of the gospels as four separate books, as I think of them in this context. I picture the gospels almost as a cube; each side a different angle, but the story is the same. They support and complement each other. And I know this is going to sound weird to all but a few of you, but the thing that makes each gospel special to me in its own way is its color. Matthew is dark chocolate brown, Mark is sort of raisin, Luke is a vibrant blue, and John is a rich green. And along with those, I find refreshing and comforting differences in how each writer presented his work. And I know you probably can’t appreciate my particular view of each gospel, but I encourage you to read them often enough to find your own personal recognition of each one. They are the life and the words of Jesus Christ, and you can’t get any better than that! This book immediately follows the gospels, and is the “then what?” of the lives of the disciples. I have, however, heard it said that a better title would be, “Acts of the Holy Spirit”. He comes onto the scene in a big way in this book, and empowers the disciples in ways they could never have predicted. It’s historic, in that it tells us about people and places and dates; but it’s also inspirational ~ this is you, and me. This is what we can and should be doing. I know more than one person who would say this is their favorite book of the Bible. The lessons that Paul teaches in this letter are the heart and soul of our beliefs. And there are more beautiful, heart-grabbing verses in this book than in any other, short of the words of Jesus Himself. Please read chapter 8. More than once. This letter is probably most famous ~ and rightly so ~ for the description of the Armor of God in chapter 6. But it also contains phrases such as, “the riches of His grace,” “He Himself is our peace,” and this little beauty: “… that you may be able to comprehend with all the saints what is the width and length and depth and height ~ to know the love of Christ.” Make this book a go-to read for you. He will do exceedingly, abundantly above all you could ask or think. Short but sweet. This letter is only four chapters long, but there are 14 uses of the words “joy” and “rejoice”. And yet Paul wrote this letter from prison. Think you can learn a thing or two from that fact right there? I do. This is a long book, relative to the books around it. But of course it’s nothing compared to some of those Old Testament missives. Home of the “Hall of Faith,” this book teaches and inspires in varying ways. I once heard a pastor do a whole sermon just on verse 12 of chapter 4. And when I’m in a stuck place, spiritually, I can find a boost simply by reading verses 1 and 2 of chapter 12. If ever you’re feeling at all smug about your spiritual well-being, then James is the place for you. A wise friend of mine calls it the Bible’s “ouch” book. James tells it like it is, and we all need that. “Whoever keeps the whole law and yet stumbles in one point, he is guilty of all.” Ouch. I hate to whiz right on by the Peter letters and the John letters, but I’m trying really hard not to select all the New Testament as my favorite books of the New Testament. So I’m select Revelation as my last choice. Revelation, as many will tell you, is a very difficult book to read. There is a lot of symbolism and prophecies. But I think what most people do wrong is in their assumption that they can come away understanding it all. I don’t think Revelation is meant to be understood. I think it’s meant to be studied, so that when the day approaches, we will know the signs and be ready. Besides, there are creatures that seem right out of Dr Seuss, and a battle with a dragon. Who doesn’t love a fairy tale ~ and it’s not very often they are true! There’s something for everyone in Scripture. But even more than that, there’s everything for everyone. Dive in and be changed! ← Don’t just take care; give it!